Shedding the extra unwanted fat from our body is the most difficult task. Moreover, dieting and starving yourself is definitely not the right way to lose weight. Having healthy juice keeps your tummy full and promotes weight loss. Preparing juice may sound easy but it actually isn’t. You need a sturdy friend to help you to extract juice. I trust Maharaja Whiteline Odacio 500 plus juicer mixer grinder, it is my best buddy in the kitchen. A perfect appliance for all your grinding and juicing needs. Put all the ingredients inside the Maharaja Whiteline Odacio 500 Plus 3 Jars Juicer Mixer Grinder and give a quick mix, blend for 1-2 minutes. The cucumber and tomato help to keep you energized for the entire day. The pepper powder helps to increase metabolism and quickly burns fat. The mint helps to flush out the toxin, all this makes the Cucumber, Tomato, and Mint Juice a perfect weight loss drink. Roughly chop the carrots and beetroots, blend well. Now add kiwi and orange juice along with ginger. Mix all together using sturdy Maharaja Whiteline Odacio 500 Plus 3 Jars Juicer Mixer Grinder until a refreshing juice is prepared. This drink is extremely beneficial to lose belly fat. It keeps the tummy full and gives a beautiful glow on the face. Put all the ingredients inside Maharaja Whiteline Odacio 500 Plus 3 Jars Juicer Mixer Grinderand blend well into a frothy juice. This refreshing drink is loaded with calcium, vitamin A and vitamin C. A perfect drink to lose weight and keep bones super strong. You can include a fruit of your choice. Roughly chop watermelon and oranges. Add all the ingredient together into the juicer and blend into a smooth juice. Drink this every morning to lose weight. 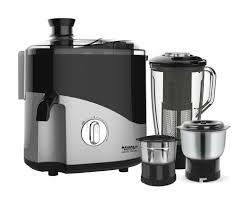 I use religiously use Maharaja Whiteline Odacio 500 Plus 3 Jars Juicer Mixer Grinder every day to prepare fresh juice. It is a perfect appliance which does juice, mixing and grinding effortlessly. The powerful 500 W is perfect for faster grinding and juicing veggies and fruits. The anti-drip spout prevents spillage of juice jar lid, say bye-bye to messy kitchen and cleaning. The juicer comes with a stainless steel juicer mesh. It makes it a durable and sturdy choice. Perfect for everyday use. The super sharp blades make the grinding effortless. You also get a pusher to extract maximum juice. The Maharaja Whiteline Odacio 500 Plus 3 Jars Juicer Mixer Grinder comes with 2 Blending Jars (for juice preparation) and the Grinding Jar is perfect to prepare chutney, dips, and dry spices. Try these 5 yummy recipes and shed those extra kilos with the help of Maharaja Whiteline 3 Jars Odacio Juicer Mixer Grinder.